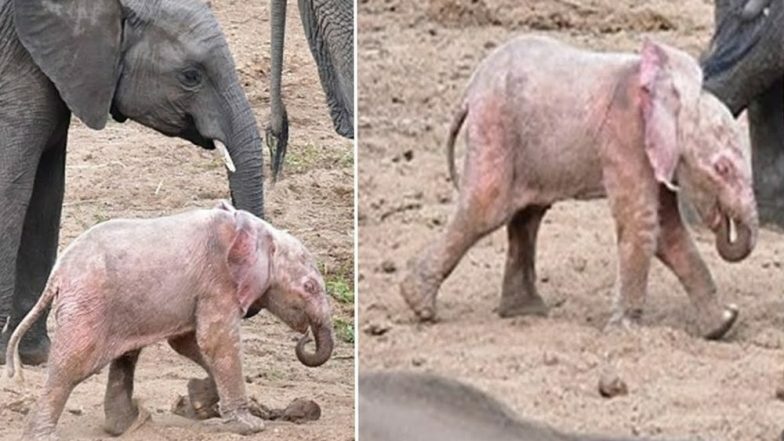 A three-week-old 'pink' baby elephant calf is going viral on the internet for its unique skin colour and adorable looks. It was captured by a safari ranger on camera playing in the grass surrounded by her family in the MalaMala Game Reserve in Kruger National Park, South Africa. It is said that the calf's skin was 'pink' because of its rare leucism condition. This little elephant calf, is showered with so much love online because of it being unique. The pink colour among elephants is usually associated with albinism; however, safari ranger, Tim Jansen van Vuuren, clicked the pictures of the calf that the rare colouring is caused by leucism, a condition which causes a partial loss of pigmentation. Rare White Reindeer Captured in Norway Ahead of Christmas 2018! View Cute Pics of The Snow Animal Goes Viral. Rare White Reindeer Captured in Norway Ahead of Christmas 2018! View Cute Pics of The Snow Animal Goes Viral. "It is a genetic disorder that will affect them for life. This is by far one of the most interesting things I have seen in the wild. Things like this are not very well documented so it's very interesting to witness as you won't find things like this in books," Tim said to Daily Mail. Leucism is a rare genetic condition which causes a partial loss of pigmentation in animals. Usually animals, especially mammals resulting in white, pale, or patchy colouration of the skin, hair, feathers, scales or cuticle. However, unlike albinism Leucism doesn't affect the eyes. Leucism is caused by a reduction in multiple types of pigment and not just melanin, as it is the case with albinism. Such rare sightings are usually a delight to watch, and pink elephants are hardly seen anywhere else apart from Disney movies.